You can donate time, talent, or treasure to make a difference on Martin Luther King Day and all year long, according to a CNN article posted Sunday by Bethany Hines. Today, the third Monday in January, was proclaimed a national holiday in 1983 to honor civil rights leader Martin Luther King Jr., though the day was not observed until 1986. Not until the year 2000 did all states become actively involved in the celebration. Taking a serious look at service to make the world a better place for the poor and powerless is one of the best ways to honor the memory of King, a Baptist pastor, on this day and throughout the year, according to his late wife, Coretta Scott King. Two years ago, for the 2016 Glimpses of Healing and Hope MLK blog post, I gathered some King quotes and asked how Martin Luther King Day inspires us to make a difference. Where do we see the glimpses of healing and hope for which Martin Luther King yearned? We are all familiar with some of his quotes (see below), but how are we getting involved with helping to bring his dream to some small fruition? 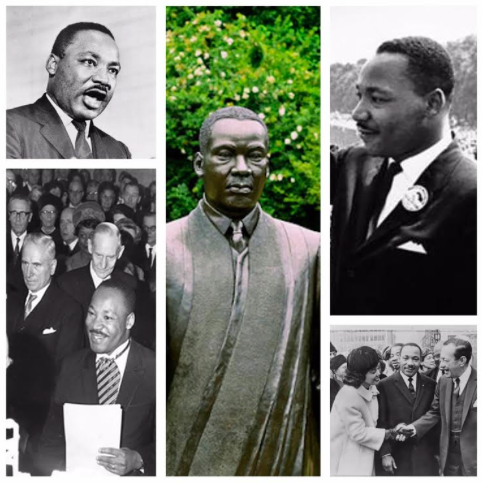 Where do you see yourself plugging into King’s dream for racial justice and harmony? How can you put what life has taught you (“all that is your life is forming you,” Cyneatha said) into practice that will build justice and harmony where you live, where you work, where you are active in your community? Congregational area groups met Sunday during formation hour after worship to renew acquaintances with others who live nearby in the church family. Pastor Janice’s sermon on what fuels hope in the new year served as a launch pad for our sharing New Year’s intentions, hopes, dreams, plans, as we wondered together where 2018 might take us as individuals and a congregation, in our city, our state, our country, and our world. A few of us agreed that we name objectives at the start of the new year (not unlike resolutions), but most claimed not to participate in resolution-setting; several offered that they become aware at the start of a new year of finding a guiding word or re-upping exercise targets and revamping eating habits. Some, who have lived in their houses a long time, mentioned sorting and clearing as priorities, while others, who have just purchased homes in the neighborhood, said they are organizing contents they brought with them. 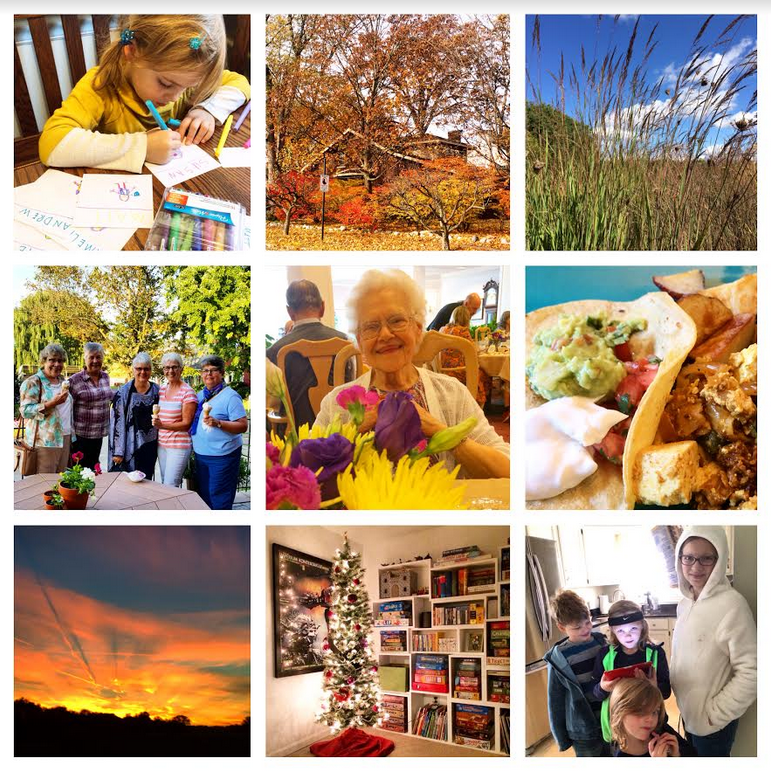 As one who documents and reports, I tend to look back on activities of the last year (or in this blog post the congregation’s past year) to see how what lies behind may project ahead to the coming year. 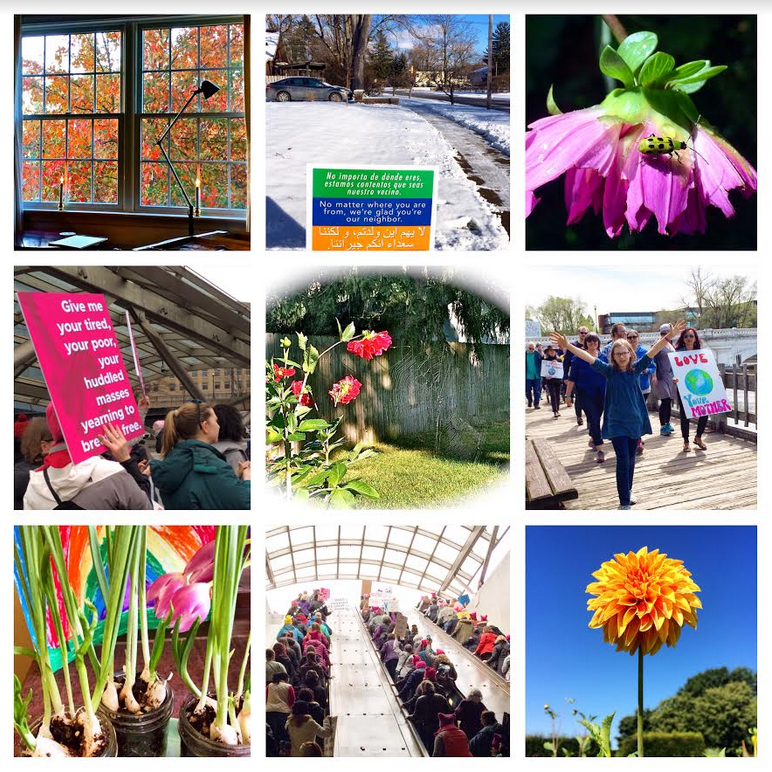 The nine photos at the top of this entry highlight Glimpses of Healing and Hope posts from the last year, some from my own life, but most with a connection to life at Kern Road. The photos depict not only the year's challenges, but some of my favorite pictures from 2017 exemplifying how nature renews and offers hope in the midst of chaos. I was surprised to find as I created our Christmas video greeting back in December how much of our family's activism in the last year took root in Kern Road reminders and announcements: participation in the Women’s March on Washington with my sister-in-law and a number of Kern Road women (see that story as told here and here), planting a We’re Glad You’re Our Neighbor sign in our front yard (see story here), participating in South Bend’s “No Ban No Wall Rally” (photo in KRMC women’s story mentioned above), taking the local grandkids to the Islamic Society of Michiana’s mosque open house (see story here), attending the moderated town hall on the Affordable Care Act (see mention here), joining the local Solidarity with Charlottesville event, and more recently finding opportunities to get involved in resisting the ICE detention center being considered by Elkhart County Planning Commissioners. Thanks to KRMCers Mark and Danile for keeping us updated on how to stay involved with these ongoing challenges and opportunities. Photos of the Metro escalator at L’Enfant Plaza, Washington, DC, and the words familiarized by our Statue of Liberty brought back these memories: “We will not soon forget the women, men, and children who gathered from all across the country, who spent time and money to assemble peacefully on behalf of justice and equity for all. They marched for many reasons as illustrated by the array of signs they carried: to stop white silence, to manage global warming, to unite against hate, to promise we will never go back, to announce love always wins, to declare themselves proud to be Muslims, to assert that our grandkids need a stable climate, to affirm that Black lives matter, to proclaim that our daughters are still watching, to acknowledge that we’re glad you’re our neighbor, to suggest we make diversity great again, to remind us that when others go low we go high. 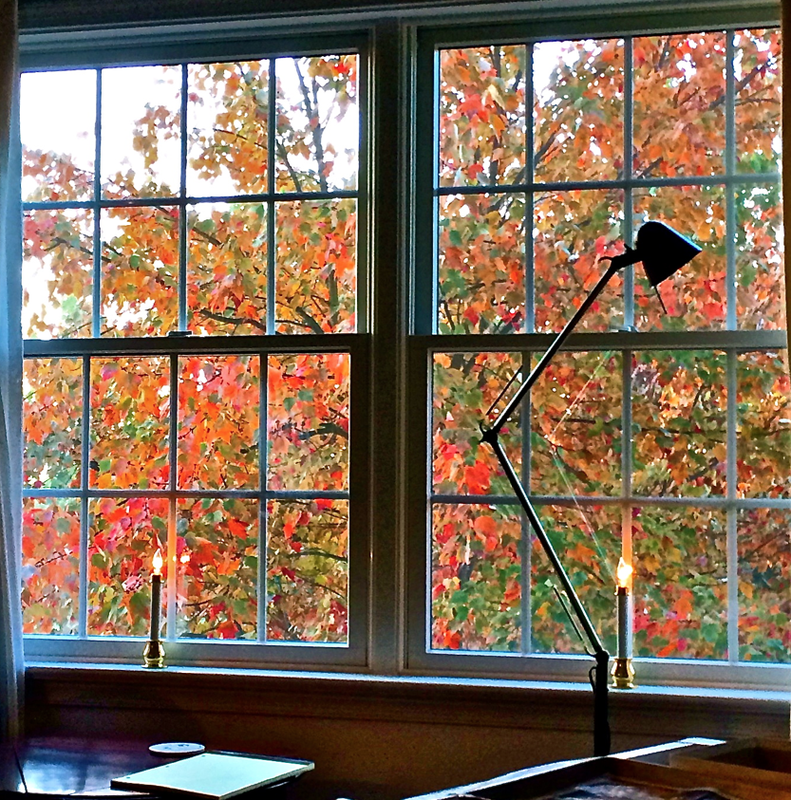 ‘Death is disorienting…transitioning from this life to the next’ (featuring the bright fall colors outside my friend’s cozy living room window where I spent the nights while my dad was dying) offers a bird’s-eye view of what it was like for my mom and me to wait with my dad for his passage from this life to the next, a scenario not unlike that of a number of KRMCers who suffered loss this last year…loss of family and friends, health, relationships, jobs, dreams. One of Parker Palmer’s most recent Facebook posts speaks of the disorientation of loss: “Finding meaning in hard experience is one of the most vital challenges we face….Who hasn’t known heartbreak? There’s the child who suffers from bullying, the young adult who suffers from unrequited love, the man or woman in midlife who sees a marriage or a career fail, the elder who endures the deaths of loved ones, the citizen who sees democracy’s values under assault.” See the poem he quotes here by Gregory Orr about beauty coming from loss. If you are familiar with the Netflix production of The Crown, you will recognize the sense of loss portrayed in the moment when Winston Churchill announces his retirement to Queen Elizabeth and walks away from his last audience with her. Yes, doors will open, doors will close in 2018. We can only imagine the surprises the new year will bring (including the hope of 50 degrees mentioned as likely this Thursday in Sunday's nightly news after our recent cold and snow)! May we be wise to the ways of the Divine as we enter the unknowns of 2018. The lectionary readings for Advent 3, Year B, where we find ourselves now on the liturgical calendar, include verses from Isaiah 61 which speak of bestowing crowns of beauty instead of ashes, the oil of joy instead of mourning, and a garment of praise instead of a spirit of despair. 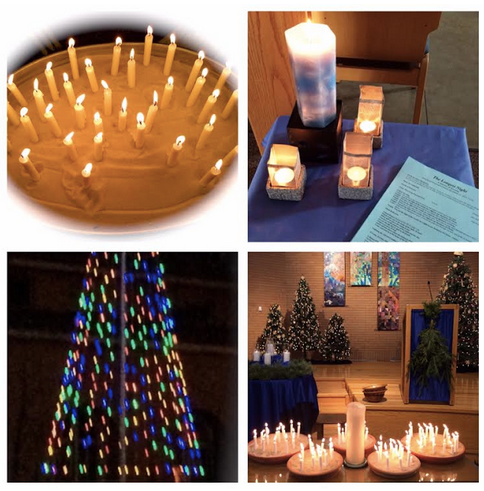 In her sermon yesterday, Pastor Janice called us to notice the joy lacing readings for the third Sunday of Advent. As she closed her sermon, she extended an invitation to come forward for anointing with the oil of joy, even in the midst of sorrow. In recent years Kern Road has offered the opportunity during our longest night service to take time together to recognize our sadness and yearning to know the Divine's presence in the midst of pain, whether suffered recently or long ago. All are invited to join us in the sanctuary at 7 p.m. Thursday, December 21, on the longest night of the year to declare that we experience darkness in many ways, even (or perhaps especially) during our culture’s long holiday celebration encompassing Thanksgiving, Christmas, and New Year’s Day. At this time of the year, when daylight diminishes to barely nine and one half hours, it can be difficult to imagine our lives six months from now when daylight will prevail once again for 15 to 16 hours. Called a Blue Christmas service in some circles, the longest night observance offers space away from the constant December refrain which screams incessantly that this is the season to be jolly. For some, this Christmas may be the first year without a loved one or a job or perhaps the first year with new knowledge of a serious health issue. For many, the season becomes a particularly difficult time of balancing painful losses as others are celebrating their joy with family and friends. As we move through the darkness of the winter solstice and begin the return to longer days and shorter nights, we pause during the longest night service to remember the dark times in our own lives and the lives of others. We will witness the lighting of our Advent wreath candles, with the first candle representing our own grief, the second our courage, the third our memories, and the fourth our love. Participants also will be offered the opportunity to light candles and plant them in sand to recognize burdens, griefs, sorrows, or whatever makes Christmas a “blue” time for themselves, others, and our world. Join us to proclaim that, even in our despair, the Divine promises to walk with us as we experience insecurity, grief, and isolation. We will seek solace together in this hope, with prayer, scripture reading, music, and quiet time as we look toward the dawn on the other side of the longest night. You will be invited to listen, to pray, to sing, to sit with whatever pain or anguish or loss you bring with you. May you find comfort in knowing that you are not alone, in knowing that the Divine comes to those who mourn, those who grieve, those who struggle. This service points us toward the hope that on the other side of even the darkest night, dawn will come. Whether your heartache involves the physical loss of a loved one or the anguish of broken relationships, the insecurity of unemployment, the weariness of ill health, the pain of isolation, the aches of poverty, violence, injustice, or, in the last few years, fear for the marginalized in our country and the endless cycle of seemingly depressing news, you are invited to acknowledge with others that Christmas can be a bittersweet time for those experiencing grief and loss. We prepared our hearts and minds for the wilderness journey of Advent yesterday as Nancy and three young boys led our waiting in the silence during the lighting of Kern Road’s second Advent candle. More often than not found scooting around the building after formation hour in a game of hide and seek, these three (including my own grandson) sat in complete silence while we quieted ourselves in order to prepare for this season of watching, waiting, listening. The news for which we are watching and waiting, Andre said, will be “news that makes a difference for everyone, world-changing news. Something big is about to happen.” Prepare to change your whole way of thinking because God’s new order is “breaking in,” he advised. Perhaps it will be the wilderness of illness or aging, a parent dies, a partner gets involved in an affair…all unbidden, but time to pay attention, no more business as usual, he said. And we have been involved too long in the wilderness of suicides, #metoo, harm to the earth and its creatures, police brutality, he added. We wait on the world front and in our congregation with those who find themselves in distress and wilderness, even as we rejoice with those whose waiting has turned to gladness, including Josh and Becky who received word of a tentative travel date to meet their daughter in Thailand and Mabel and Dario who have finally been awarded a restaurant permit after a long period of waiting. Elaine and I went to Lessons and Carols at Church of Our Lady of Loretto on the Saint Mary’s campus Sunday night where the sights and sounds and fragrances of Advent swirled around us…the building’s stunning interior and gentle candlelight, the soft gurgling of the baptistry nearby and beautiful choirs and congregational music with bell choir and organ, the smell of soft, melting wax followed by extinguished flames during the candle-lighting…all of which drew us into the watching, waiting, listening of the season. I resonated with these words from the dismissal: “Our spirits quiver between trust and terror” as we continue on this Advent journey, each facing our own wilderness. Can you identify your times of wilderness? How has the Divine met you in your personal wilderness experience? The pastor I heard preach the Advent 1 service at my mother’s retirement community Sunday called Isaiah 64:1-9 a “rant for rescue.” Whether the passage begins with “O that you would rip open the heavens and descend” in The Message or “Oh that you would tear open the heavens and come down” in the New Revised Standard Version, the implication of desperation is clear. “The author of this portion of Isaiah most likely wrote these words during the time following the Israelites’ return from their exile in Babylon. Having made their way home, they were wrestling with questions of what their life, their community, their relationship with God would look like now. Isaiah 64 gives voice to their longing for a God who seems absent, even as they grapple with guilt over their own brokenness,” according to Jan Richardson’s post at The Advent Door back in 2008. As Pastor Ray at the retirement community explained to his listeners, the people in this text are yearning for release from their exile: the opportunity to return home to a life as they had once known it, yearning to go back to the vineyards, to the relationships left behind. A fog of despair settles over them when they realize Jerusalem has been destroyed and their own neighbors no longer want them to come home. Isaiah speaks into this darkness, repeating the cry of the people, reminding them of their wandering in the wilderness for 40 years, reminding them that the Divine can heal the hopelessness of their lives. “If we are honest, we will identify with the exiles,” Pastor Ray asserted. In our darkness we cry out, too, yearning for a sense of God’s presence. 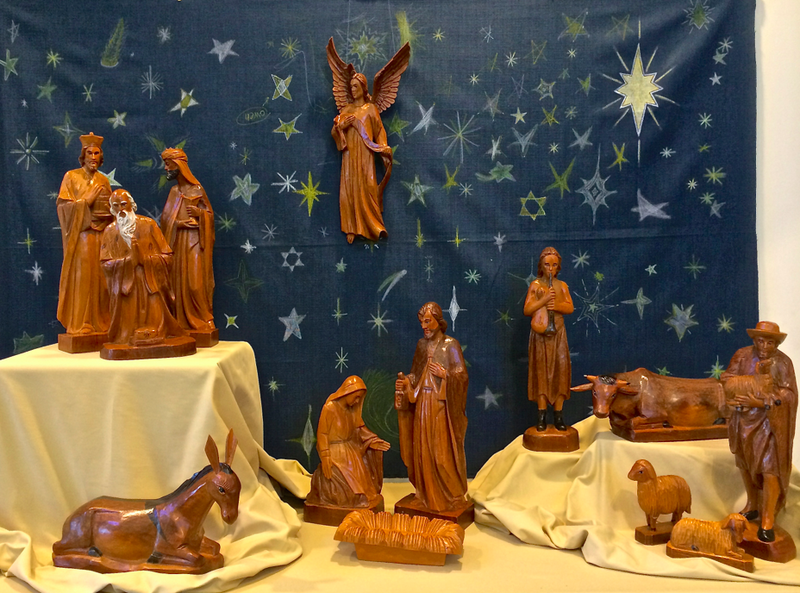 Advent, this season of hope, begins by inviting us to own our darkness, he observed. What does your personal darkness look like this Advent season? In response to your rant for rescue, imagine the Divine penetrating your darkness and welcoming home the parts of yourself that live in exile. Make it an Advent practice this year to claim the light that overcomes your personal darkness. Gratitude board…thankful for family and friends and food and warm houses and the glories of nature and so much more! A proliferation of gratitude stories is lighting up the internet this Thanksgiving season with news that gratitude is beneficial to your health. Polizzi offers “three easy ways to bring more gratitude into your life” including offering thanks for each new day, breathing a daily gratitude prayer one meal a day, and keeping track for the next 10 days of one thing for which you are grateful. And he has compiled a list of potential gratitude “inspiration” ideas as you ponder those things for which you are grateful…consider what you like about yourself, what you are learning from challenges, your favorite people, the good things about your job or your location, what you are looking forward to, the state of today’s sky. Certainly there is no end to the things for which one might muster up gratitude, even at the close of a year which may have seemed more trying for many Americans than usual. This Los Angeles Times story details “10 reasons why it’s beneficial to cultivate an attitude of gratitude” that extends beyond Thanksgiving: gratitude empowers you, helps fight addiction, combats the Facebook blues, boosts self-control, helps you sleep better, fosters a sense of community, aids in fending off depression, facilitates your becoming a better spouse, makes you an improved boss/manager, increases life satisfaction for kids. “Thank you for the new day. How are you expressing gratitude to the Divine and those around you? A good friend from Kern Road offered to take me to Vesper Chorale’s performance of Brahms’ Requiem, perceiving that it might play a role in my navigating the grief journey of losing a parent. The chorale, which rehearses at Kern Road Mennonite Church, is conducted by KRMCer Wishart, and for this past weekend’s concert included Kern Road singers Mary, Brenda, Vic, and Nevin, among other personal friends and acquaintances from the surrounding area. I had no trouble imagining losing myself in this performance, to be staged in the beautiful St. Monica Catholic Church, Mishawaka. For this opening concert of the chorale’s 25th anniversary season, KRMCer Murray played tympani, and many others who identify with the congregation were among appreciative listeners. Having sung the requiem twice more than 20 years ago, I was already acquainted with the music’s soaring, surging power and both the English and German words, but I became particularly attracted to the possibility of basking in the piece as part of the journey of loss after reading Rhonda Miska’s post, Grieving with Brahms’ Requiem, at the U.S. Catholic website in preparation for the concert. “After a death we often struggle to integrate the reality that our loved one is gone and yet somehow mysteriously not totally gone. I had been with my grandmother when the veil was thin, during her final hours when it felt as though my role was to be a midwife for her departure from this world. After being at that precipice, in that intensely powerful space between life and death, being back in the world of making hotel reservations for the funeral, organizing photographs for the wake, and tracking down the email addresses of second cousins was disorienting,” Miska wrote. And, the conductor continued, “Uncertainty also surrounds his motivation for the theme and choice of lyrics. Why quote so much scripture when his belief system no longer supported it? We know from his comments that he hoped to write a requiem for the living—to imbue the music with comfort for the sorrowing.” Unlike a typical mass for the dead in Catholic liturgy, this requiem offers consolation to the mourners, in the words of author James R. Oestreich in a New York Times article posted in May 2017: “Rather than dwelling on the judgment of the deceased, (Brahms) seemed intent on consoling those left behind.” Oestreich adds that the piece “has become something of an anthem for our time, with grand social and political reverberations” about which you can read more at this link. 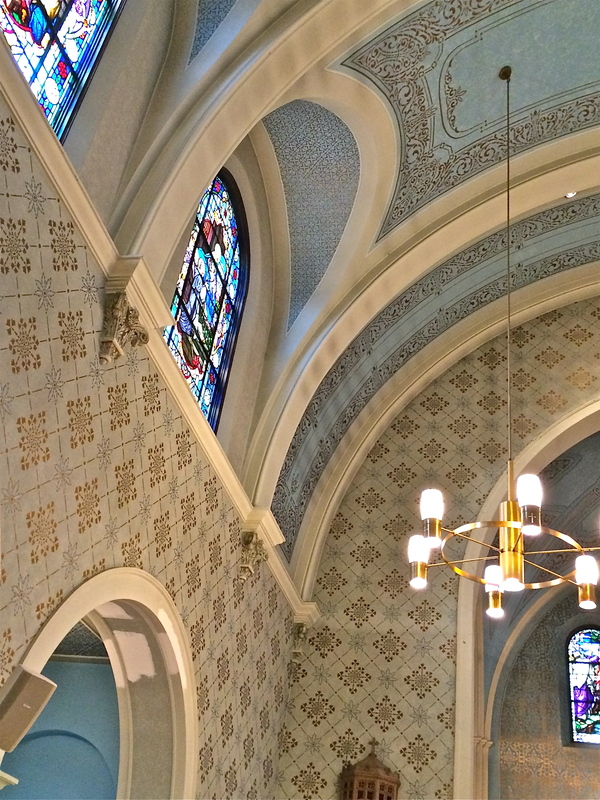 I enjoyed learning more about the requiem at this Harrisburg Symphony Blog post, which includes details about each movement (and a no-longer-available recording of a performance of the requiem at the Vienna Musikverein). In his introduction to the work prior to its performance, conductor Wishart suggested that one way to experience the music might be “to close your eyes and let the music wash over you. The more often you hear it, the more meaningful the music becomes,” he added, noting that youtube.com features many renditions. “What good art can do for us is offer a container for universal human experiences—like grief—which are at once common and deeply personal. While the many tiny particularities of our departed loved ones—the precise way he laughed, the specific way she brewed her coffee or folded the laundry—are what we most remember and miss, the grief journey is common and fundamental to our existence. Artists like Brahms extend an enduring hand across space and time to accompany us and offer the consolation that while our particular loss is unique, the human experience of grief is shared,” Miska concluded in her article on grieving with the requiem. In Singing, A Mennonite Voice, authors Marlene Kropf and Kenneth Nafziger propose the theory that “music gives us (Mennonites) a faith with flesh and blood and breath and ushers us into realms of glory and grace.” They are speaking of congregational singing when they say, “We will know that the Lord is still our Shepherd because our songs will set the truth quivering in our bodies, minds, and souls. Singing will bring us into the presence of the Shepherd who leads into green pastures and beside still waters to the eternal feast of God’s presence.” For a similar reason, I suggest listening to “Brahms bursting in air” (quote from the conductor’s introductory comments) offers solace to the grieving soul. Pastor Janice spoke two Sundays ago, as we observed All Saints Day at Kern Road, of the recent loss of her aunt. In the last year of walking with her father’s sister before her death, Janice said she saw her aunt give up possessions and her apartment, her strength and independence. Though my 96-year-old father had fractured his hip a week earlier in a fall, I could not have known that I would be looking back on Janice’s words of wisdom so soon, as I left church after that All Saints worship service for the drive to eastern PA. Daddy had eaten a hearty meal of pureed food soon after surgery that morning to repair his hip, according to my mother and brother who visited him, but, by the following day when I arrived, my dad did not recognize any of us. I had not waited with a loved one seemingly in the act of dying since I was 12 years old, when my great grandfather passed away at his home on the fainting couch as my mom and I and my six-year-old brother visited. This time I waited again with my mom, who carried on with grace, caressing the forehead of her partner of 72 years while the room filled and emptied as med techs from my mother and father’s personal care apartment, a long-time friend of mine, some of my parents’ church friends, women who lovingly serve meals in the personal care dining room, nursing and hospice staff floated in and out to the tune of Daddy’s slightly labored breathing and a CD of old hymns playing quietly on a boom box in the background. Mom and I wondered, quietly to ourselves and aloud to my dad, who would greet him on the other side of this transition…might it be his son Greg, who died 43 years ago, or his parents, or some of his father’s large family of aunts and uncles and cousins who would welcome him at the close of his nearly 97 years here on earth? Whatever one believes about the past, present, or future, these passages are difficult, perhaps most difficult for those who do not easily imagine a life after this one, where the joys of reuniting with family and friends suggest memories of failing bodies, failing minds, and the general absurdities of life could melt away. “Death is disorienting,” a good friend texted, and so it was, in a new way each time we passed another milestone: upon first learning Daddy had broken his right hip, realizing he likely had had a stroke after surgery, discovering he no longer recognized us, watching him begin hospice, seeing him propped up in the sunshine in a wheel chair, being there as he took his last breath (which we recognized as his last breath only because another never came), IDing him for the undertaker, seeing his obit at the funeral home’s website, viewing a photo of the newspaper death notice. My two brothers and I are grateful for cousins who helped transport our mother to the hospital to see our father in our absence the week after his fall; for medical personnel who took care of our father and supported us in our exploration of what to do next; for social workers from inside and outside our family who helped us comprehend hospice and when to begin using it; for retirement community caregivers, other staff, administrators, residents who lovingly inquired about our parents and lifted us up in the midst of a difficult time; for the hospice nurse who visited on Sunday to pray with my mom and my dad and me; for the gift of pre-paid funeral arrangements made nearly two years ago and the minimal funeral home follow-up necessary in the moment of loss; for local PA friends who made visits to our mother on occasion, some with flowers and another with a Ten Thousand Villages “strength” stone. And what helped us carry on in the short run? Chuckling together with family and friends and caregivers, not only at Daddy’s foibles but at all the ways he made us laugh, brought comfort. Debriefing nightly and eating ground cherry pie with the local friend who housed me was invaluable. As the one of my dad’s three children most likely to post on social media photos and shout-outs for accompaniment on the journey of waiting together, I took consolation from my Facebook friends, including a high school classmate who reminded me of Daddy’s living on through his children, grandchildren, and great grandchildren. I loved the many-colored heart emoticons and expressions of caring left by friends and family and acquaintances. A friend from Jim’s earliest days of teaching college in Upland, IN, wrote: “Oddly, it seems to me, one of my favorite memories was being with my father when he passed. I hope you will have the same experience. Our love to you and your family during this difficult time.” Countless family and friends wished us peace and blessing, love and prayers, light and strength, grace, hugs, and the comfort of memories. One shared that he was leaning my way, another that she was crying with us, yet another said, “May God hold you all in your grief and breathe comfort and joy over you.” I am grateful for each and every sentiment that came our way. My mother’s youngest sister fondly recalled via email the pastel pink, blue, yellow, and green glass tea set my dad gave her when she was a child. My uncle happily agreed to share at an early December service a tribute to my father, with whom he worked as a research chemist in the early years of their professional lives. The Open Fifths and Notable Women provided solace through their Saturday night concert at Goshen College, where songs like Abide with Me (which I already had chosen to be included at my dad's memorial service), along with Wanting Memories, Will the Circle Be Unbroken, and Angel Band opened the floodgates and spoke to my personal grief in myriad ways. 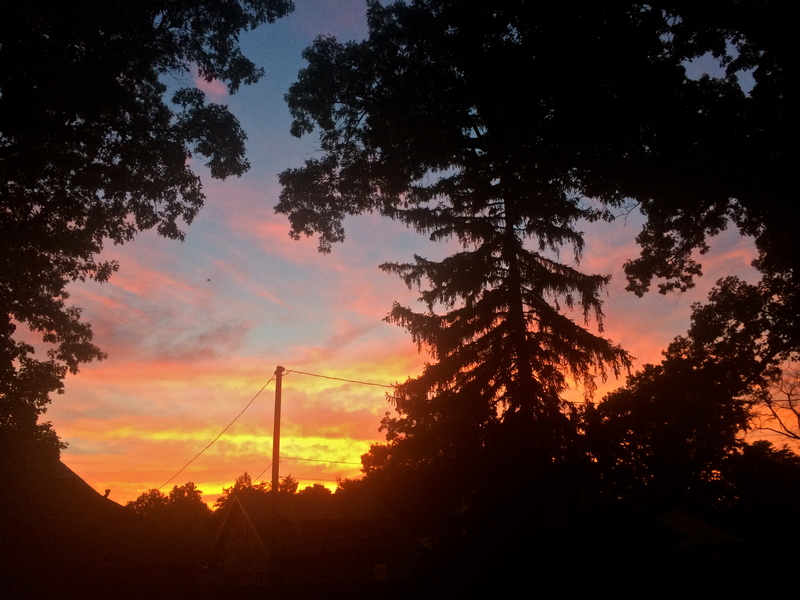 How we confront crisis and find comfort will look different for each of us…combing through old photos, writing, listening to good music, and connecting with family and friends console me. How have you accompanied others on the grief journey? How would you want to be accompanied?